Sometimes there’s only very narrow access to an excavation site. 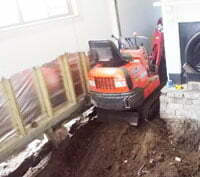 Normal excavating contractors won’t be able to help because their excavation machinery is simply too wide to get in. 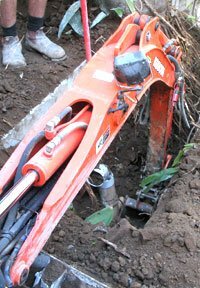 Thin & In Excavations provide extremely narrow access excavation for Wollongong, Illawarra and Sutherland areas. Thin & In Excavations are different because even if there’s only very narrow access (as little as 750mm) their mini excavator is able to get in and do your job. Please see images on left to get an intuitive idea of just how thin our excavator really is. Thin & In Excavations use a small excavator that gets in to work in tight spaces with minimal churning of the ground. Compared to other mini excavators (e.g. typical Bobcat), the Thin & In excavator is narrower, makes less mess and is operationally very quiet. For footing or foundation excavation and earthworks relevant to house building, home extensions, patios and decks, paths, garages, carports, sheds and for under-house excavation and support etc, Thin & In Excavations are at your service. We can operate in small areas with narrow access where wider, more space hungry excavators like Bobcats would fail. Older or established buildings may be affected by subsidence due to various factors. Cracking in the structure above ground is often the result of some form of subsidence. To overcome the problems associated with subsidence, foundation replacement or pier replacement may be necessary. This involves temporarily jacking up and supporting the above ground structure, while digging out and replacing building foundations, footings, piers or stumps and is known as underpinning, foundation repair, re-piering or re-stumping. Wayne Cameron is a licensed underpinner and provides this important service for the Wollongong area. Thin & In provide trench excavation for sewer, stormwater, groundwater, septic and drainage pipes etc. 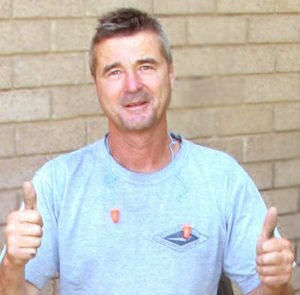 Wayne is able to perform complete drainage jobs and is able to install the piping because he is licensed to lay drainage, storm-water and sewer pipes and subservice water. Thin & In can do swimming pool excavation even when there is very narrow access and tight space. If you’re putting a pool in your backyard, Thin & In have the equipment to do the job with minimal fuss. If you’re landscaping your garden and need an excavating contractor to do the hard work, Thin & In can help whether you are creating mounds, digging ponds, moving and positioning rocks, putting in retaining walls, or various other landscape gardening activities. Get us to help you with post holes and general preparatory excavation for fence construction. We have an auger attachment which makes light work of digging holes. We can also help with excavating footings for walls etc. Wollongong excavating contractor, Thin & In Excavations is fully licensed and insured as a drainer, and for underpinning, peering, sub floor ventilation and ant-cap replacement. 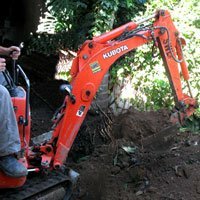 If you need excavation work done in Wollongong, Illawarra or Sutherland areas and you only have very narrow access to your site, contact Wayne at Thin & In Excavations on 0414 488 752 or see the contact us page for further contact information.